I don’t know about y’all, but I don’t have time to use a carpet cleaner on my rug every time I vacuum it. Between keeping a household, raising a kid, having a dog, deep cleaning my rug daily is on the bottom of my to do list. In between shampooing, I use this super simple carpet freshener to keep my rug smelling clean without spending a ton of time on it. To learn how to get wholesale member pricing, click here. Fill half of your glass jar with baking soda. Add 15-20 drops of your essential oil of choice. I used Thieves because I love the smell and it has great immune system supporting qualities. It’s an easy way to passively receive its benefits. After you add your essential oil, fill the jar with more baking soda. Don’t fill it all the way to the top. 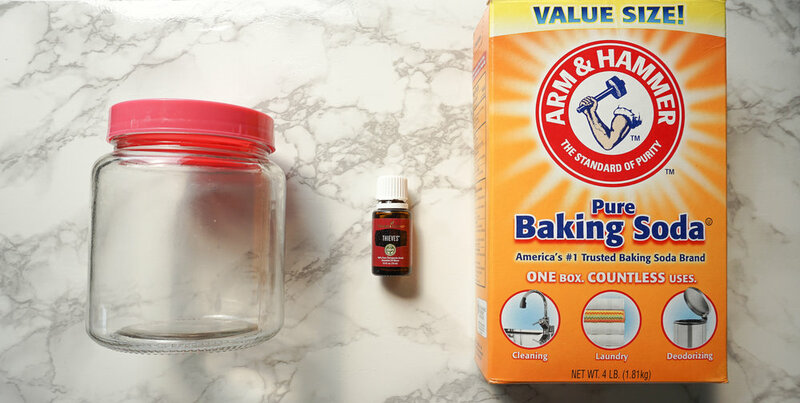 Add another 15-20 drops of essential oil to the baking soda. Attach the lid to your jar and give it a good shake. That’s it! This is probably one of the simplest DIY projects you can make for your house. When you go to use this carpet freshener, sprinkle it in the desired areas and vacuum it up during your normal cleaning routine. You can use as much or as little as you want. I keep this jar underneath my sink with my other cleaning items.